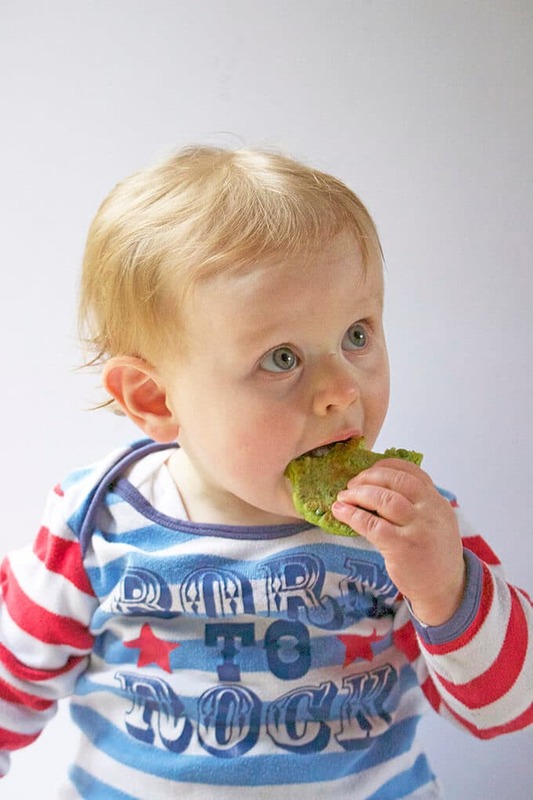 Pea Fritters - a great finger food for babies, toddlers and big kids. 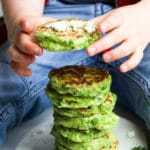 These Pea Fritters (or green pancakes as Finn calls them) are easy to make and can be whipped up quickly. They taste delicious both hot and cold, so any leftovers are great for the lunchbox. I first published this post in Nov 2013, I have updated it to include new photos, more text and nutritional information. What I love about this recipe is that it is so simple to prepare and you can whip them up in minutes. Most of the ingredients are blended in the food processor with the remaining being stirred through. Half the peas are blended into the mixture and the rest are stirred in. This provides the fritter with a nice bit of texture. If your child doesn’t like “bits” in their food then you can choose to blend all the peas into the batter. I’ve added feta and parsley for flavour but this can easily be customised to taste. I often adapt the recipe to what I have available. They taste delicious with mint or basil and fantastic with some lemon. I’ve made the pancakes quite small in size, using 1 tbsp of the mixture. This is a great size for little hands or for fitting in the lunch box. Cook over a medium heat until golden brown, approx. a couple of minutes on each side. 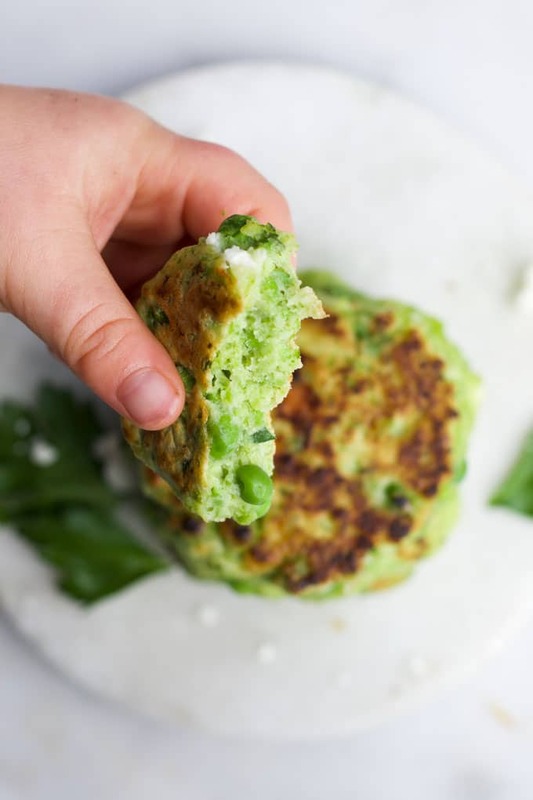 These pea fritters are so versatile. You can serve them as a delicious savoury breakfast, pack them in the lunchbox or serve them as part of a main meal. I love to dish them up with a delicious dip, often just yoghurt mixed with lemon and herbs. They also taste amazing with a tasty avocado salsa. Serve them with vegetables or a salad to complete the meal. Sometimes I add a poached egg on top too. I pop these fritters in an airtight container and store them in the refrigerator overnight. If I want to store them any longer I generally freeze them. To freeze them I individually wrap and then store them in a freezable container. Nutrition facts are an ESTIMATE only, calculated using an online nutrition calculator. Hello Amy! I made the pea fritters for the first time today and they were delicious! I will be taking the left overs to work tomorrow for my lunch. Thank you for the ideas. Hi Ruth, you can leave the feta out. You could add some fresh mint to give them more flavour. ? How old does my daughter have to be for me to try this recipes on her? Hi Israh, you probably would want to reduce / cut out the cheese in this recipe for sodium levels. You could add some chopped mint instead. My youngest did baby led weaning so ate what we ate from 6 months. I did try to make sure that everything I served was low sodium and had no added sugar. Hi, I’ve just made these for my little girl and she absolutely loved them… Thanks for sharing the recipe! Do you think they would freeze well? How long are they good in the freezer for ? Hi Renee, I would freeze them on a baking tray until frozen. Transfer to an airtight container and freeze for up to 3 months. Can I cook these on the waffle iron? Hi Kendra, I don’t have a waffle iron so have no experience of them. Sorry! Worth a try?! Do you think I could use the split pea purée that I made for baby food? My little hates it and this could be a better way to get him to eat peas. Could I make these with chickpea flour for gluten free? Hi Erin, I’ve never tried them with chickpea flour but I think they would work ok with it. ? Hi – these look great and I’ve just made a batch for my baby. We’ve been doing baby led weaning for the past 2 months, but I’m worried he’s choke on the peas? I want to try this recipe but my baby is allergic to eggs. Any idea what I can substitute the eggs by in this recipe? Applesauce? Hi Caroline, I’ve never tried it myself but I know that a lot of people replace egg with flax seed. 1 tbsp ground flax seed mixed with 3 tbsp water for each egg. Let me know how it goes! Could we try potatoes as an egg substitute too? I used pureed pumpkin in place of the egg (1/4 c = 1 egg), and the result was excellent. Thanks for the recipe! Brilliant, thank you so much for letting me know. I get asked a lot for egg replacements and have never thought to try pumpkin in this. ?? These are absolutely AMAZING! A total hot with everyone in the family. Thank you for sharing. These are absolutely AMAZING! A total hit with everyone in the family. Thank you for sharing. With BLW there aren’t really any month stages of food. They eat what you eat from 6 months (no honey, whole nuts, whole grapes etc though). I also watched sodium levels and limited cheese / other salty foods. To reduce sodium levels in this you could leave out the feta and replace with some fresh herbs for flavour? Mint is lovely 🙂 Good luck with your blw journey. Hi I’m the middle of making these now, they smell great ? Hi Sinead, yes I have frozen these and they worked well. Although you don’t have to I have always re heated them as we much prefer them warm. I’ve never tried baking Laura, sorry. Is there a substitute for the flour? Or can I make them without flour? We are one month into BLW and are trying to avoid processed foods. Thank you. Hi Carla, I’ve never tried these with a different flour so can’t give an alternative, sorry. You should try my lentil & spinach pancakes though – basically just lentils and spinach. They are so tasty and you could take out the spinach and throw in some peas. I just baked these and they turned out great! They didn’t flatten out so they are little pea “puffs” and have a good texture! Fab! I’ll have to try baking them for a change – pea puffs sound fun! They are also a huge success with my older kids (3.5 & 5.5 years) and even my husband – they all love the “Erbsli-Tätschli’, as we call the pea fritters in Swiss German ?. Thanks again and keep on going, your blog is great! Hi Flurina, thank you so much for your kind comment and I am so glad you enjoy the blog. I love hearing how people adapt the recipes and what works well. I often sub the herbs and cheese depending what I have in the house too. Thanks again for your feedback, Amy ? These are amazing! I’m about to make another batch and will try a different cheese this time for something new. They freeze wonderfully and are so great to have on hand. My now 12 month old loves them! She loves your blueberry fritters as well. Will have to try a few more of your recipes! Hi Shannon, thank you for your feedback. I’m so glad the recipes have been a hit and I hope you have success with the other recipes too. ? Does the peas have to be cooked ? Hi Valerie, No you don’t need to cook the peas before hand. Hope you enjoy ? Why do you only food process half the peas? Can you just put all the ingredients in the food processor? I Sarah, I just process half to give the pancakes more texture. You can easily process them all if you wish ?? Huge hit with my 8 & 10 year old. They are really enjoying having new things in their lunch boxes – I did 6 of your recipes! Thanks for the feedback, 6 recipes – wow! Glad you are making use of the site! I’m making a batch of these tomorrow to have for the lunch boxes! I’ve had this recipe pinned on Pinterest for a few months now and finally had all the ingredients to make them today! I subbed half the peas for corn, and my 1.5 year old loved them! As did I. Definitely going to make these again and again. As another commenter said, they would be great to take places since there are no crumblies. Hi Adriana, Thank you. I love it when I here positive feedback like this so thank you for taking the time to tell me. I’m making a batch this weekend to pop in the freezer and to take out for lunch boxes! Thank you so much! It wa so easy to make …Just tried these for my 10 month old and he loved them. Quick question… what would be the best way to freeze them? And about how long would they last in the fridge? Hi Christina, thank you for your feedback. I freeze them on a tray and then once frozen transfer them to a zip line bag. I haven’t kept them any longer than a day in the fridge so can’t say for sure how long they will last refrigerated, sorry. My mum has given us a tin of mushy peas and I’ve been looking for a way to use them – and I’ve found it! Can’t wait to try this recipe, I love making bits like this that we can take out with us for my little man! Excellent! I’m not sure if they add extra water or other ingredients to tinned mushy peas, if so you might need to alter the amounts slightly. The recipe is pretty flexible though so I’d say it would be good! I hope you and your little man enjoy! ?? Hi Cat, thank you for your feedback. I’m loving the sound of adding spinach – yum! My daughter has dairy allergy, what can I replace the feta cheese with? Also she is 7 months old but we are doing baby led weaning. Would this be good for her to have? Hi Roxy,you can just miss out the feta all together. You could try adding some more herbs for flavour. I gave this to my son at the same age and missed out the cheese to reduce the sodium level. Hello what is the best way to reheat them please ? You could re heat them in the oven. I’d play on a baking tray and cover with foil and heat for about 10 mins. Or you could microwave them. Hi, im making them now they look delicious. Was wondering if you could freeze them? Hi Veronica, Yes I have frozen them in the past. Thank you for this recipe! Just wanted to know if I could maybe use cream cheese instead of feta (that’s what I have at home only) or would it make the consistency too runny to form into pancakes? Hi Jennifer, sorry for the late response. I have never tried it with cream cheese but I’m sure it would work well. I often make them without the feta and add in a lot more herbs. The recipe says to use self-rising flour, but do you think regular, white whole wheat flour would be ok? I hope so because I think my 11 month old would really love these! Yes you can use regular flour. I’d add 2tsp baking powder to the flour ?? I just made these and they completely crumbled. On medium heat they were cooking too slow but when I tuned up the heat they burned then when I flipped them they completely crumbled. I used Almond Flour as a substitute and added baking powder and salt to create a self rising flour. Any tips? Hi Courtney, sorry these didn’t work for you. I’m guessing it is because you used almond flour as I haven’t had any other feedback like this. Without experimenting with other flours in this recipe I can’t say for sure what to change. If you are avoiding regular flour then I have a couple of fritter recipes that use buckwheat flour (sweetcorn and quinoa fritters) or chickpea flour (rainbow fritters) that you may like to try. Can you freeze the actual mixture rather than the cakes themselves? Hi Tracy, I have never actually frozen the mixture before. If you were to try it I’d place in a zip lock back and ensure all the excess air is out before sealing and freezing. I’d thaw in the refrigerator overnight then snip a hole in the corner and pipe the fritters straight into the hot pan. Let me know if you try it, I’d love to know how it works out. hello! can these be frozen once made. and how would i reheat them? Hi Sonia, I have frozen these before lots of times. I usually pop them in my sons’ lunch boxes and they eat them cold. I can’t remember if I have ever reheated them. I’d suggest around 60 seconds for 5/6 fritters. You could also re heat in the oven – cover in foil and bake for around 10 mins. Made these today so good!! I actually turned them into muffins and used white cheddar instead of the feta..so yummy and easy!! Brilliant Dina, thanks for the feedback. You may have just given me inspiration for a new post – cheesy pea muffins – fab! Love the sound of this recipe! Can these be baked? Thanks Sara. I haven’t actually tried baking them but a reader said she baked them as muffins and they worked well. Thanks Toni, wow you have been busy today! A couple of bites is a good start, hopefully the next time it will be more. Thanks for your feedback! I had to laugh… Tonight we came home from Costco with a bag of frozen peas, only to realize we already have an unopened bag of the same. 6 lbs of frozen peas… Yikes! So I was scrolling through my Pinterest and had just thought “I should look up recipes to use up some of those peas” and immediately your recipe was there, without me even searching for anything! Can’t wait to try it! 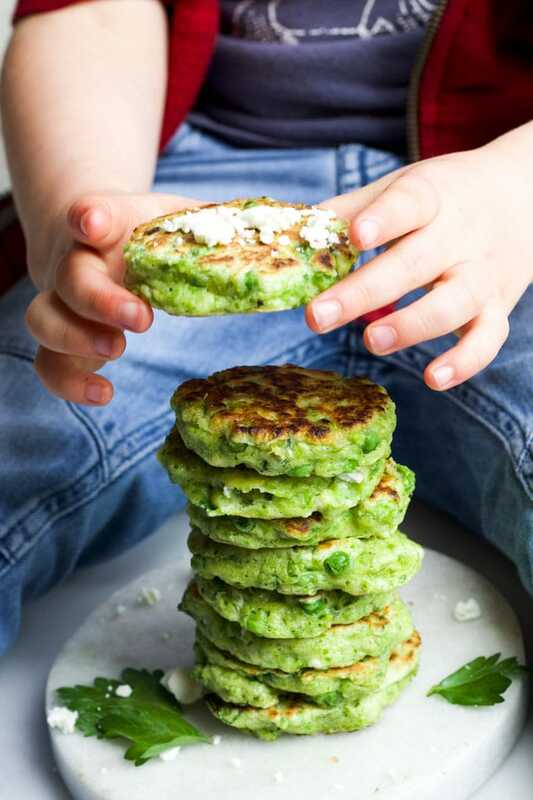 Wow, you can make a lot of pea fritters with that amount of peas!! So glad you came across my pin and I hope you enjoy them! Just made these tonight for my 12mo old and they are absolutely DELISH! It was super easy and fast to make! Will definitely be making these again and maybe next time, I’ll make them for the adults with some avocado crema to fancy it up!! I tried making these and it was a glutenous mess! The batter was so sticky and felt like rubber. When I tried pan frying them they were too chewy in the middle for my little one. I barely processed the mixture, I’m not sure what went wrong 🙁 was looking forward to these! Hi Emily, I’m not sure what went wrong for you on this recipe as I usually receive very good feedback. Did you use the same ingredients or did you alter the recipe at all? I had the same issue. I didn’t add any cheese but everything else was the same. They were like hockey pucks. What is the texture supposed to be like for both the mixture and after they are cooked. I’d like to try again. Hi Elizabeth, did you use self-raising flour? Or did you add baking powder if using all purpose? If you look at the pictures you can see the raw mixture in the pan. It is very thick in texture. If you scroll further down you will see the texture of the inside of the fritter (picture of my son holding half a fritter) . My 15 month old loves these so much! She’s been eating them for months and I’ve had to replenish my freezer supply many times! I’m going to try the carrot stars and the lentil spinach fritters soon. Have you tried this specific recipe with any other veggies? I made these today, with a couple substitutions. 3 tbsp of pumpkin for the eggs (I ate the last ones for breakfast. Oops!) and finely ground oats with baking powder in place of flour. With a touch of almond milk to thin. They didn’t cook in the pan like they should’ve, too much moisture. So I threw them in the waffle maker and they turned out awesome! He’s eating one now and loves it! Hi Jenn, thanks so much for your comment with recipe substitution ideas. I love that you managed to rescue the mixture by adding it to the waffle maker. I must try these as waffles, a great alternative! Hi Jessica, sorry about the delay. Your message ended up in my spam folder. My sons usually enjoy them cold (in their lunchbox). To reheat you could pop them in the oven – pop required amount on baking tray and cover with foil and bake 175c / 350f for around 10-15 mins. Alternatively, add the fritters to a microwavable plate and heat for 1-2 mins on high. These are great ! I used the onion and mint and subbed the eggs for 3/4 cup applesauce due to an egg allergy. My daughter really enjoyed them ! I got to freeze a bunch too 🙂 Thanks ! Hi Amy, we tried these for breakfast this morning and they were great! We don’t have a food processor so I used a stick blender on the peas and spring onion and then hand whisked the lot together. The mixture turned out (I think) a bit more dense than intended – any tips for making without a food processor to reach the right consistency? Thanks! Hi Becky, sorry for the delay. It really depends on your baby and the method of feeding she is used to. I was happy giving these to my son when he was 6 months but he did baby led weaning so was not used to swallowing purees. You can miss out the cheese and replace with some mint or other fresh herbs to keep the sodium level down. 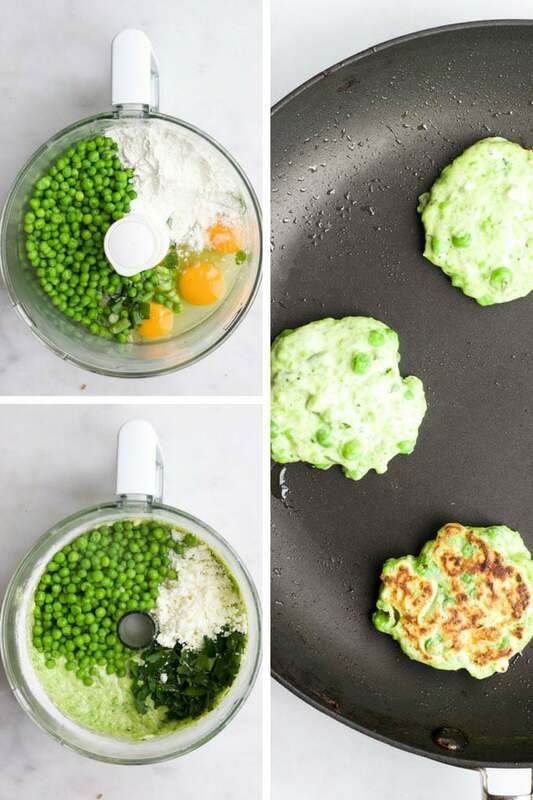 You can also puree all the peas for a smoother fritter. Wondering if anyone has tried substituting chopped cooked spinach for the parsley. I am wanting to make these for a senior who struggles to keep weight on. I just made these. No spring onions or feta, so sauteed a shallot and added a small amount of grated parmesan. So tasty, and not many left for the baby!! Fab! Hope baby got one in the end 😉 ! Thanks for taking the time to rate and comment. Hey this looks so beautiful and tasty recipe i really liked it looks healthy as well m really excited to make this recipe and taste it really good instructions given properly and keep posting such recipes really enjoyed your recipe, Thanks for sharing with us. These are delicious! Could they be cooked in the oven instead of frying? Thanks, Lorna 🙂 . I don’t think I have ever tried baking these so can’t say for sure. I don’t think they would be as good but it would be worth a try. I’d lightly spray with oil before baking. Hi Amy I m not sure what a serving size would be…how many fritters would make 1 gram? Hi Gemma, you can just use the same amount 🙂 Enjoy!